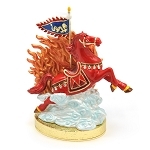 The Bejeweled Red Dragon combines the power of the dragon and flaming sword. 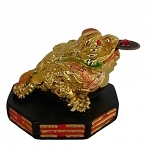 The dragon is the traditional feng shui product that has ultimate powers to bring good fortune and the flaming sword is the feng shui cure to lower down trouble, damage, arguments, lawsuit and legal entanglement caused by flying Star 3 Jade. In addition, it eliminates darkness and annihilates ignorance using its wisdom and intelligence. 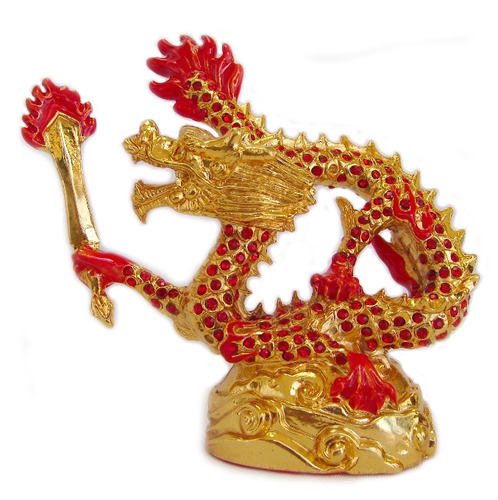 The red dragon using red color, which belongs to fire element, to lower down the wood element generated by argument star 3 Jade. 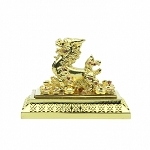 In 2016, you can display this feng shui item in NW position. 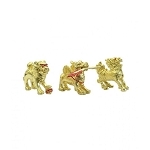 The beautiful red dragon is made of copper, gold plated and accented with a lot dazzling red jewels. It is approx. 4" x 2" x 3 3/4.